This is a belated post . . . I really turned 30 a few months ago. Some of this might be old news to my friends, but this cake will never be old news and it will be a cake you will CRAVE and never forget. 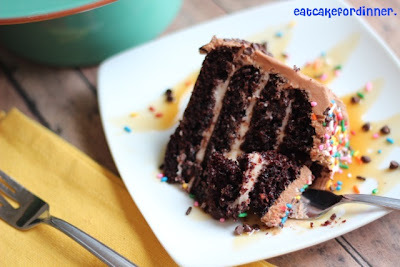 Four layers of eggless super-moist chocolate cake filled with browned butter cream cheese icing, smothered in chocolate frosting and garnished with mini chocolate chips and sprinkles all served with a drizzle of caramel sauce. A little over the top? Maybe, but . . . it is DIVINE! One of the BEST cakes I have ever made and ever eaten. I needed something over- the-top. I turned 30. I LOVED my 20's and I really did not want to leave that era behind. I wanted to stay in it FOREVER. The week before I kept thinking things like, "this is my last Friday in my 20's", "this is the last time I will eat pizza in my 20's", does this mean my metabolism is going to hit rock bottom and I'm really going to have to start watching what I eat even more? While I was having my little "pitty party", my sweetie was out shopping with his mom. He surprised me with an over-the-top 30th Birthday Present. My jaw just about hit the floor when I opened the box. I have never had anything like this before. A COACH handbag and my beautiful M-I-L gave me a matching Wallet! 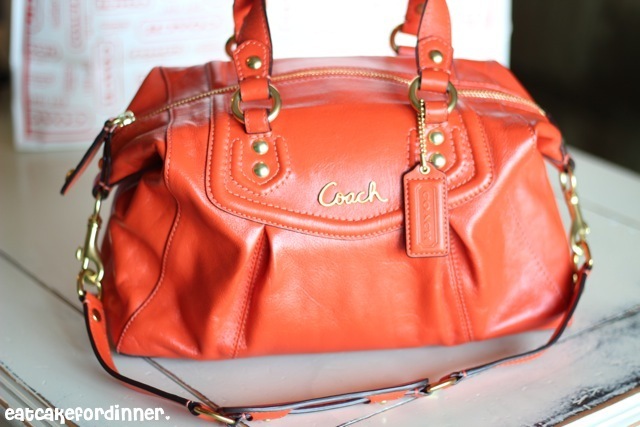 Cutest purse I have ever seen. Best 30th Birthday present a girl could get! My F-I-L gave me some cute mixing bowls and a big red enamel coated dutch oven. My mom and dad gave me some moo-law. I'm wanting to get a new vacuum. Anyone know of a good one for a decent price? Did any of you have a hard time when you hit 30? I keep getting told that my 30's will be better than my 20's? I'm not entirely convinced yet. We will just have to see what the next 10 years bring. Hopefully, it will be filled with lots and lots of cake and frosting. Particularly, this cake and frosting. It was so freaking good. All of the flavors and textures blended perfectly together and I may have found my new go-to chocolate cake recipe. It is so moist and chocolatey. I loved that there are no eggs in it. That makes it super easy to cut the recipe in half. I didn't want a ton of cake hanging around, so I made a small cake. I knew browned butter would give my cream cheese filling just the richness and nutty flavor I was looking for. I used my favorite chocolate frosting to cover the entire cake. It has a nice mellow milk chocolate flavor. 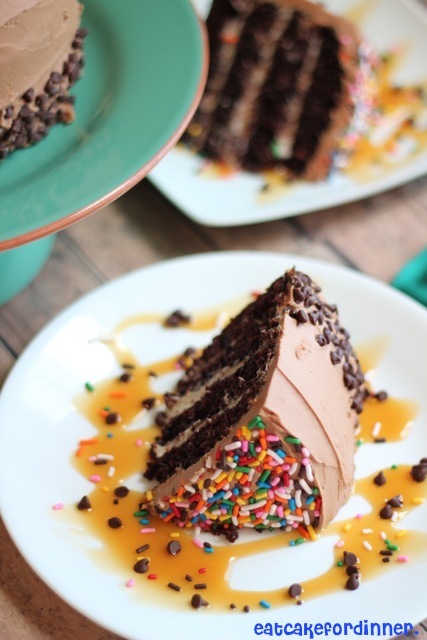 I love the texture of mini chocolate chips in desserts, so I added some of those and what is a birthday cake without sprinkles? Preheat oven to 350 degrees. Grease and flour two 7-inch cake pans (see notes section down below); set aside. Whisk flour, sugar, cocoa, baking soda and salt together in a large bowl. In a separate bowl combine the hot water, instant coffee, vegetable oil, vinegar and vanilla and whisk until combined. Pour wet ingredients into dry ingredients and whisk just until blended. Divide batter evenly between greased cake pans. You don't want to fill them anymore than halfway or they will overflow. Bake for 30-35 minutes or until top springs back when lightly touched. Remove from oven and cool in pan for 15 minutes. Then invert onto a wire rack and cool completely. Add butter to a small saucepan and heat over medium heat until browned and nutty smelling. Butter will get foamy right before it is done. There will be brown bits in the bottom of the pan. Be careful to not burn it. Remove from heat and cool completely. I usually put it in the fridge. Combine cooled browned butter, cream cheese, vanilla and salt. Beat until smooth. Add powdered sugar, one cup at a time and beat until smooth and creamy. Combine butter, cocoa, vanilla and salt and beat until smooth. Add the powdered sugar, one cup at a time, adding milk as needed to reach desired frosting consistency. Don't add too much milk or it will be too soft to frost the cake. Beat until smooth and creamy. Slice cooled cakes in half lengthwise, so you have four layers of cake. Place one layer on cake board and spread evenly with 1/3 of the cream cheese filling. Top with another cake layer and 1/3 of the filling, followed by another cake layer and the remaining filling. Top with last cake layer. Frost a very thin layer (crumb coat) of chocolate frosting over top and sides of cake. Refrigerate for at least one hour. Remove from refrigerator and frost with remaining chocolate frosting. 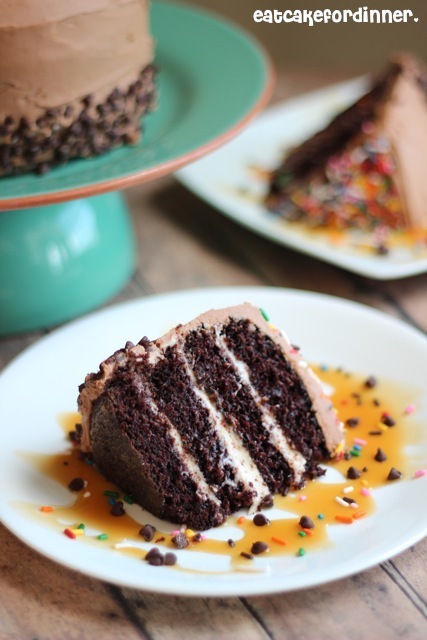 Press mini chocolate chips into the bottom half of the cake and lightly press sprinkles onto the top of the cake. Slice and serve. Jenn's Notes: I used two 7-inch round glass baking dishes with tall sides to bake my cake layers. I know that is an odd size and most of you won't have them. 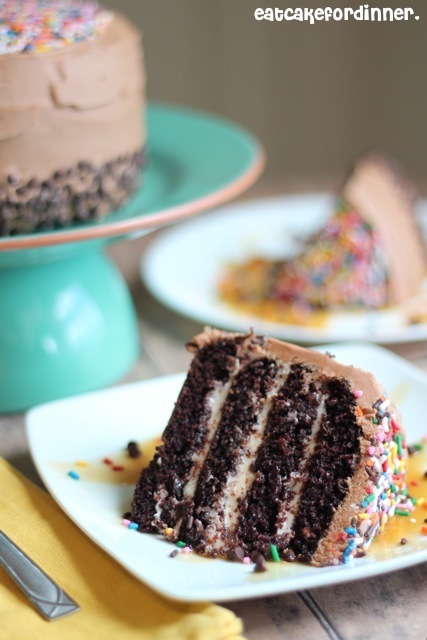 You can always use 8-inch or 9-inch round cake pans. Your layers will be slightly thinner and the baking time will vary slightly, but it will work. Well happy birthday to you, Jenn! Sounds like you had quite the celebration and lots of lovely gifts! You can absolutely believe it when people tell you that your 30s will be better than your 20s! No doubt about it. And even though it's still 10 years away and you might have a hard time believing this, your 40s will be even better than your 30s! Enjoy every day of all your years and make sure you have no regrets, then each day will be better than the last! Killer looking cake you have there too! YUM! You cannot have anything over the top when you are turning 30, especially a cake. I have to say that I didn't feel any different when I turned 30, I'm 32 now, but I can honestly say that 32 has been one of the greatest times in my life. I've learned so much about myself and have never been happier! Jenn, 30 is the new 20. I just recently had my 36th bday and had a harder time with it than I did turning the actual 3-0. That said, I also had a quarter-life crisis before there was such a thing at 25. Different ages, different stages I guess. So Happy Belated and rock your 30's. It's still you only a year better. Btw, the cake looks divine and I love a new chocolate cake recipe to try and add to my collection. And as for a new vacuum, I cannot recommend highly enough the Shark navigator lift away. I really wanted a Dyson, but they are some major cha-ching so I researched the heck out of the Shark and I am SUPER happy with my decision. Plus if you buy through the Shark website, they give you a 10 year warranty on the product, but even if you buy through WalMart, Amazon, or Target they'll still warranty it for 5 years. Good luck! I really liked my 30's, I had my Son when I was 30 and had my Daughter when I was 21. With each "decade" comes a different time in your life, go out and make each day great! Your cake looks and sounds delicious! Happy belated birthday! 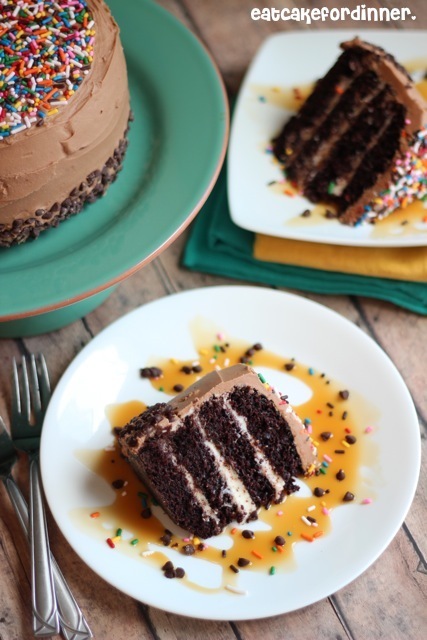 I have made this incredibly delicious cake for many years, but as a sheet cake--so now I'm wondering how to get that filling and frosting both on a sheet cake! You birthday sounds incredible... What a deliciously rich cake!!! I love the fact it had rainbow sprinkles, that's so fun! 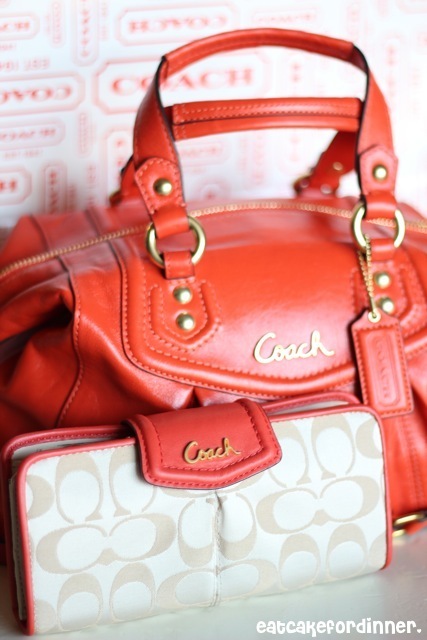 What a lovely Coach bag, too! I turn 30 later this year. I'm also sorry to leave my 20s behind, but can't help but to be excited for what God has in store! Thanks, Leslie! Make sure you get an over-the-top cake for your 30th! What people are telling you is true. 30's was the best for me. Turning 30 was no problem for me. I cried on my 25th birthday, though (for some reason - dont know why). OMG that cake looks amazing!! Glad you had a Happy Birthday, and what an awesome hubby you have. Last Christmas my hubby surprised me with a Coach bag, I totally had no idea he was going to get me one. This year I told him he could surprise me with a matching wallet.. ha ha! 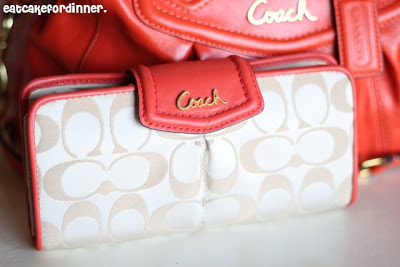 You have an AWESOME hubby too and you totally need a matching wallet! Thanks so much! Happy birthday and your new purse is FABULOUS!!! The cake looks great too. What a gorgeous cake! All those layers - NEED! And happy birthday, I want that purse. SO MUCH. Turning 30 didn't bother me, but I have now realized that in 7 yrs I will be 40. And that's weird. Cute purse...good job Jake! I'm impressed. Holy cow, that is way weird!! Thanks. This does sound divine! I wish I had it for my bday! Browned butter cream cheese frosting?? I'm sold.